Sarah Palin takes on one of the highest ranking Democrats right in his own backyard, all while causing another uproar by urging tea parties to quote “reload.” And the question is, are comments like that inciting violence and name-calling over the health care bill and the like? When I talk about it's not a time to retreat, it's a time to reload, what I'm talking about -- now, media, try to get this right, okay? That's not inciting violence. What that's doing is trying to inspire people to get involved in their local elections and these upcoming federal elections. It's telling people that their arms are their votes. It's not inciting violence. It's telling people, don't ever let anybody tell you to sit down and shut up, Americans. The third guest, New York Times columnist Ben Zimmer, wasn’t so incendiary, but didn’t offer any disagreement. 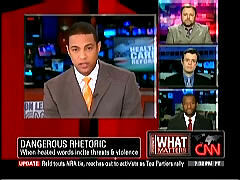 DON LEMON: What Matters tonight, the vigorous debate over health care reform has stirred up a lot of emotions across the country including death threats and vandalism against members of Congress. Now, earlier I spoke about the power of words with Tim Wise, he’s the author of Colorblind, New York Times columnist Ben Zimmer and Marc Lamont Hill of Columbia University. And I started by asking if the White House had perhaps helped fuel some of the hostility with its own terminology? TIM WISE: Back in the summer of last year using the phraseology of a public option. I think they were naive in the sense what they forget is for the past 40 years whenever we talk about public anything in this country. Public transportation, public housing, public schools, an awful lot of people hear, whether it’s meant or not, hear “people of color” as the beneficiaries. So when you put that out there, a lot of the white folks who already are being told by Limbaugh and Beck that this health care bill is just reparations for slavery end up having that reinforced by the somewhat naive post-racial rhetoric of the administration. I think they played right into that. LEMON: I see Mark shaking your head trying to get in here. Mark, why are you shaking your head? MARC LAMONT HILL: Because I think there's been very consistent strategy from the right to racialize public policies so that poor white people who are often most vulnerable or most in need of those policies will vote against it to align themselves with a certain kind of whiteness, whiteness of property. So the poor white guy in Mississippi who needs welfare votes against welfare because he thinks he's voting against a poor black woman in Harlem. 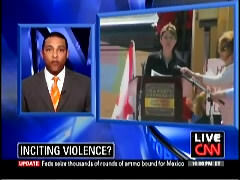 LEMON: Listen to Sarah Palin as she spoke earlier today at the Tea Party rally in Searchlight, Nevada. SARAH PALIN: When I talk about it's not a time to retreat, it's a time to reload, what I'm talking about -- now, media, try to get this right, okay? That's not inciting violence. What that's doing is trying to inspire people to get involved in their local elections and these upcoming federal elections. It's telling people that their arms are their votes. It's not inciting violence. It's telling people, don't ever let anybody tell you to sit down and shut up, Americans. LEMON: Mark, listen, freedom of speech. I always say that people have a right to say whatever they want. I will fight tooth and nail for that, but is it responsible for someone to say that? Especially a leader, considering the anger that's going on right now?